If you like rugs, but don't know much about animal print rugs, now is the time to get acquainted! First of all, when is the best time to think about animal print rugs? When your home décor is plain and your furniture and color scheme beg for more personality. When your living room needs a finishing touch that brings the entire room together. When your lifestyle demands a decorative feature that will give you a splash of the exotic. In situations like that, no common rug pattern will do the job, so forget the Persian rugs and floral rugs you see in everyone else's living room. You need the exotic or eclectic. Think animal print rugs. 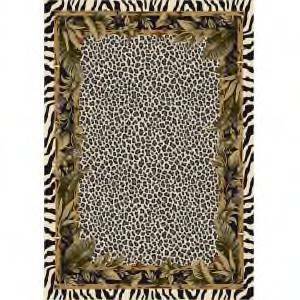 Your favorite spot deserves a wild touch and you want a rug that will "wow" people when they see it or set foot upon it. 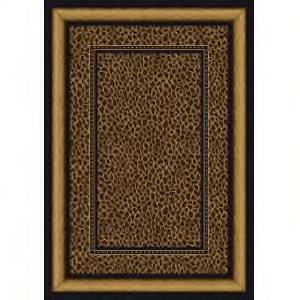 The variety of animal print rugs that are available gives you an option for all areas of your home. You can even move that "wow" feeling from room to room. Whether you’re the type of person that digs a "contrasty" zebra stripe print, or if you’re more of an African collage lover, animal print rugs can set a warm and sassy mood that turns the ordinary into the extraordinary. Sometimes Mother Nature has the best design trends of all. 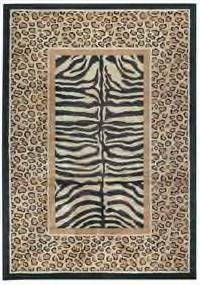 Animal print rugs are available in a variety of styles, textures, and materials. What you choose for your home or office will depend on your personal needs, the size of your space, and what materials you prefer. They're available in most standard types of rug material, including wool, nylon, acrylic, olefin, D-tex, cotton, and even brushed suede, so you're sure to find a rug that meets your expectations. Once you've got an idea of size and material, you'll be amazed by the selection of graphic designs. From all-over fur patterns to quirky shapes and patterns, you'll be able to pick the perfect color and style combination. The all-over pattern mimics actual animal pelts (in a more formalized rectangle, square, or round shape). Many all-over styles also have handsome borders and inset geometric designs, adding to the flavor of the animal's natural color scheme. 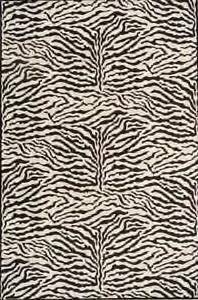 Zebra, leopard, tiger, and giraffe are the most common pelt designs used in this type of animal print rug and their bold layouts complement many interior color schemes. Collage designs are also widely popular and offer a mixture of colorful animal prints in one piece, so the decorator doesn't have to choose one critter over another. Layered stripes, spots, bands, and fur patterns create dynamic, earthy designs worthy of the finest sitting room. Some collage patterns also include wild animal portraits or paw prints, as added design interest. Probably the cleverest design of all is the animal print rug that mimics an actual animal skin. With uneven edges and a life-sized look, they're just like old-fashioned pelt rugs, but endangered animals don't have to get hurt in the process! You'll find tiger, zebra, leopard, bear, snow leopard, cheetah, and numerous other "pelts" in eye-catching shapes. They look great in your game room, den, or sporting room - and also make a fun addition to kids' playrooms. The realistic pelt-shaped rugs are done with natural suede, or other faux fur materials, for the ultimate in looks and comfort. Whether you need a wide area rug to fill a room, or a touch of color in a small space, consider using animal print rugs. They'll add the right amount of spice and energy to any décor.